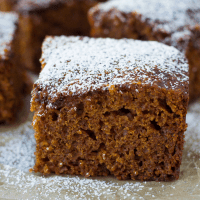 This Gluten-Free Gingerbread Cake smells like the holidays and is perfectly moist. This festive dessert is one everyone will love! Preheat the oven to 350F. Grease a 9×9-inch pan. Add the dry ingredients to a large bowl. Whisk to combine well. In the bowl of a stand mixer, mix together the granulated sugar, brown sugar and egg until light. Add the molasses, maple syrup, and coconut oil. Mix well to combine. With the mixer running on low, slowly add the dry ingredients. Beat to fully incorporate. Add the water and lemon juice, and mix well. Pour the batter into the prepared pan. Place the pan in the center of the preheated oven, and bake 30 minutes, until a toothpick inserted in the center comes out with, at most, a few moist crumbs. Cool before serving. Dust with powdered sugar if you like and enjoy! Keep leftovers in an airtight container.